Prospect Realty was founded in 2000 by long time local resident and broker Todd Creel. Our primary goal is to provide friendly, professional real estate services to buyers and sellers from all over the world. As a small office, we offer our clients personalized care, and we are available to meet their needs seven days a week. 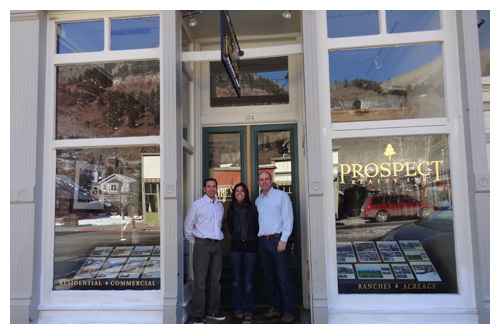 Our office is located on Main Street in the heart of historic downtown Telluride. We specialize in the “in-town” market with extensive experience and knowledge in the town of Telluride. We also offer comprehensive expertise in ranch properties on the regional mesas, properties in the Mountain Village, Ski Ranches, Aldasoro, Elk Run and beyond. We pride ourselves in treating our customers and clients as family, assisting them in every aspect of the transaction from locating the perfect property, skilled negotiations, maintaining their property and introducing them to other quality service providers in the area. We are always here when you need us. Founder and owner of Prospect Realty, Todd moved to Telluride in 1987 when the town was still a growing resort. With twenty-seven years experience in the Telluride market, Todd has an overall knowledge of the area, which helps him assist his clients in finding the perfect property or selling their place in a timely manner at the highest value. Todd has three children, ages 15, 18 and 21, all of whom have been raised in the town of Telluride. Outside of real estate, Todd is actively involved in local radio station KOTO, serving for many years as its board president and a weekly DJ. He has also been a member of the Planning and Zoning commission and the board of the Ah Haa School for the Arts. Todd was actively involved in the town’s acquisition of the Valley Floor, a truly amazing community accomplishment. He has served on the Open Space Commission and the Valley Floor Preservation Partners. Todd is an active outdoor enthusiast, enjoying all of the vast opportunities Telluride has to offer: skiing, mountain biking, rafting, hiking, fly-fishing and more. An avid musician, Todd enjoys playing music with other local musicians and regularly attends the numerous musical events from the Bluegrass festival to the Jazz and Blues & Brews fests. In 2012, Todd began producing The RIDE Festival with his sights on creating a rock and roll music festival that highlights iconic as well as emerging bands. Todd truly enjoys his work and finds helping others search for and find their own dream very rewarding.